This Tuesday is pancake day, or Shrove Tuesday as it is formally known, and households across the country will be rooting around in cupboards and pulling out half-used bags of flour in preparation for that once-a-year pancake feast. I always laugh at how popular this day, centred on using up simple ingredients to prepare for lent, has come to be. It *is* possible to make pancakes any day of the year, but we all love a bit of tradition. I’ve teamed up with Bonne Maman this pancake day to create recipes using their delicious range of jams, sauces and conserves. We’ve been eating Bonne Maman jam as a family for as long as I can remember – the gingham-topped jars making a regular appearance at our breakfast table. Jams are fantastic as they capture flavour from seasons past. This recipe for Blackcurrant Ricotta Berry Crepes has Bonne Maman blackcurrant jam right at the heart, as blackcurrants can be tricky to source in early spring. The jam brings all that rich flavour and add a beautiful colour to the crepe filling too. You’ll love this pancake recipe as it is so simple to remember: the 1-2-3 method. The crepe batter is formed by whisking together 100g flour with 2 eggs and 300ml milk; and that’s it! This method makes around 12 pancakes, so double or triple it if you’re flipping for a crowd! I like to have all the toppings on the table, surrounding a plate piled high with fresh pancakes so that people can dive in a create their own. Chances are, as people dust off their aprons and get pancaking, your Instagram and Facebook feeds will be flooded with beautiful stacks and delicious-looking creations. Starting out as a home-baker, I’ve had to hone my food styling skills in order to produce images that stand out. I’m still a relative novice in this area, but thought I’d share a few top tips to help get those images making an impact. Good lighting is absolutely key to good food photography. You could create the prettiest plate in the world, but if you try to photograph it under yellow-tinged kitchen spotlights, it simply won’t look appetising! Natural lighting is best, so find a spot near a window (not too close or your images will come out too bright) to take your images. The best spot might not be in the kitchen, so get creative as to where you decide to set up. My kitchen doesn’t get much light at all, so I currently take all my images (including these) on the coffee table in the lounge! Whether you’ve got a fancy camera or simply use your smartphone (I’m currently using a Google Pixel 2), no amount of retouching or editing can make food look fresher or better cooked! Try to source the best quality ingredients you can afford. It is always lovely to have a few raw ingredients in your images, so when you are cooking, keep an eye out for any particularly pleasing berries or herbs and save them for garnishing. The food should be the star and everything else you place around the food should enhance it, not take away from it. When cookery books and magazine images are shot, a props stylist sources hordes of beautiful crockery, linens and tableware in all manner of colours to suit the dish being shot. Obviously, this isn’t an option for us shooting at home, which means we have to be creative with what we place around our food. That wedding crockery you eat off each day with a distinctive pattern isn’t always the best choice, as it is often quite busy and can take away from the delicious food you’ve cooked. Likewise, anything too shiny, like cutlery and glassware, creates reflections which can sometimes include you, the photographer, so are best avoided! So where do you find appropriate props? You have to keep your eyes peeled! Charity shops are where I find most of my pieces, and are often super cheap. These pieces of cutlery were about 15p each. Look out for unique but versatile items that can be used multiple times. Stick to fairly neutral colours too, so the food can be the star. Don’t be afraid to embrace the mess! A smudge of jam, scatter of flour or smear of chocolate make your images look authentic. Remember to take a few pictures as you begin to eat too, as some foods look better with a bite or two out of them. Feeling inspired to create your own pancake masterpieces? Find my recipe below or a whole load more delicious pancake recipes over on the Bonne Maman website here. 1. Whisk together the flour and eggs in a large bowl until smooth, then gradually add the milk to make a runny batter. Cover until ready to use. 2. Heat a 20cm frying pan over a medium heat and use a pastry brush to apply a thin layer of melted butter (to stop the pancakes sticking). When the pan is at the right temperature, add a ladleful of batter. Swirl the pan to coat the bottom, then allow the pancake to cook for 1 minute on each side, or until cooked through. Keep covered and warm in a low oven while you fry the rest. 3. Beat the ricotta in a small bowl to loosen it up. Spread 1/4 of each pancake with ricotta, drizzle over the jam and scatter the berries across the top before folding up. Enjoy immediately! Forget Valentine's Day; this year it has been upstaged by our nations love of pancakes. I take pancake day as a great excuse to eat pancakes for every meal of the day. It is a great example of a day of crowd-pleasing, entertaining food that is simple to create – everyone loves a pancake! For the last few years, I’ve developed a recipe that works every time to create thin, crepe style pancakes: the 1-2-3 method. Easy to remember and even simpler to create. Here are my favourite sweet and savoury twists on my basic recipe; spinach and herb pancakes with salmon and browned butter pancakes with butterscotch and toasted pecan nuts. 1. Melt the 50g butter in a 20cm frying or crepe pan that you will fry the pancakes in. Remove from the heat. 2. Place the pancake batter and all the remaining pancake ingredients into a food processor then add the melted butter. Blitz until the mixture is smooth. Don’t worry if there are small pieces of spinach or herbs in the batter – this adds texture to the pancakes. 3. Heat a 20cm frying pan over a medium heat, then test the pan by ladling in a small amount of batter. It should take around 1 minute to brown on the bottom. If it browns too quickly, lower the temperature slightly, and do the opposite if it cooks too slowly and becomes rubbery. 3 When the pan is at the right temperature, add in a small knob of butter and then pour in a ladleful of batter. Swirl the pan to coat the bottom, then allow the pancake to cook for 1 minute on each side, or until cooked through. Keep covered and warm in a low oven while you fry the rest. The green becomes more vibrant on cooking. 4. Serve the pancakes warm with smoked salmon, soft cheese and chives. These are best eaten immediately. 1. Place 50g of the butter into a small saucepan over a low heat until completely melted. Cook the butter, stirring occasionally, until the white solids separate out and begin to brown at the bottom of the pan. The butter will foam and start to smell toasty. Remove the pan from the heat immediately and add the browned butter to the pancake batter. 2. To make the butterscotch sauce, place the cream, remaining 25g butter, sugar and vanilla extract into the saucepan you used to brown the butter and heat gently for 3-4 minutes or until the ingredients are well combined. Turn up the heat and allow the mixture to bubble for a further 2-3 minutes or until thickened. Season with sea salt to taste, then pour into a jug and set to one side. 4. Wipe out the frying pan and add the chopped pecan nuts. Toast the nuts for 2-3 minutes, keeping them moving around the pan so they don’t catch. 5. 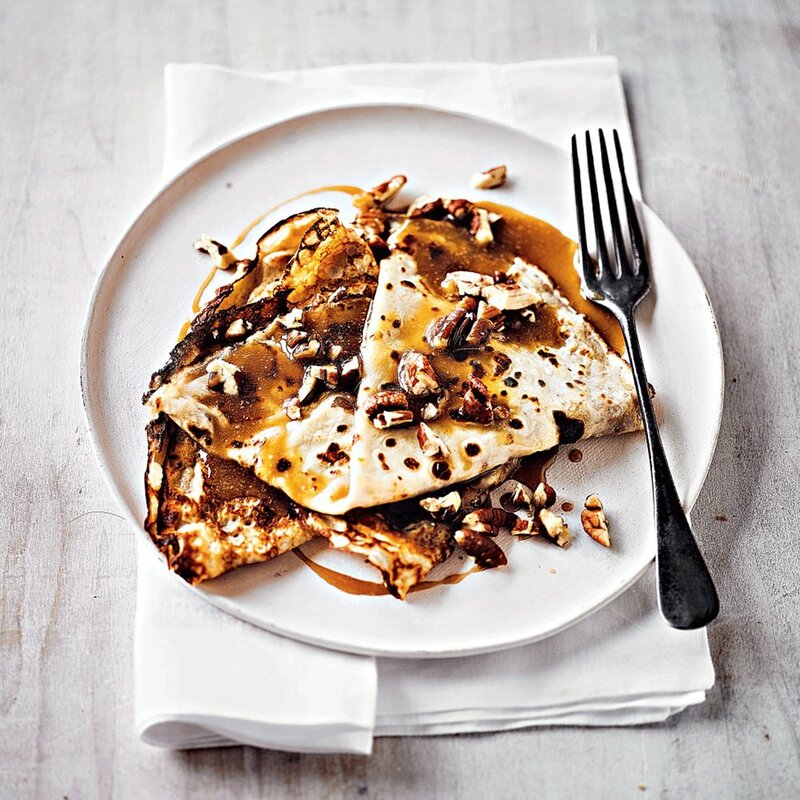 Serve the pancakes with the butterscotch sauce and the toasted pecan nuts. These are best eaten immediately. Happy January to you, Baking Martha readers! Starting the new year made me think about how i can improve the start of each day, so i've come up with a few easy, homemade breakfast options. It's cheaper to make your own than to buy at the shops, and you control exactly what goes in. I only really discovered granola last year, and instantly loved it as every mouthful is a little bit different from the last. The best thing about making your own is that you take control over what goes in. Like it sweeter? Add more honey. Prefer nuts to fruit? Swap out some dried fruit for nuts. This is the recipe I like best; just the right about of nuttiness matched with toasty sesame with just enough honey, dates and apricots for sweetness. Eat by the bowlful with yogurt and fresh fruit or simply with cold milk. For those mornings where time just runs away, try my mango and passionfruit bars – perfect for a breakfast on the go! 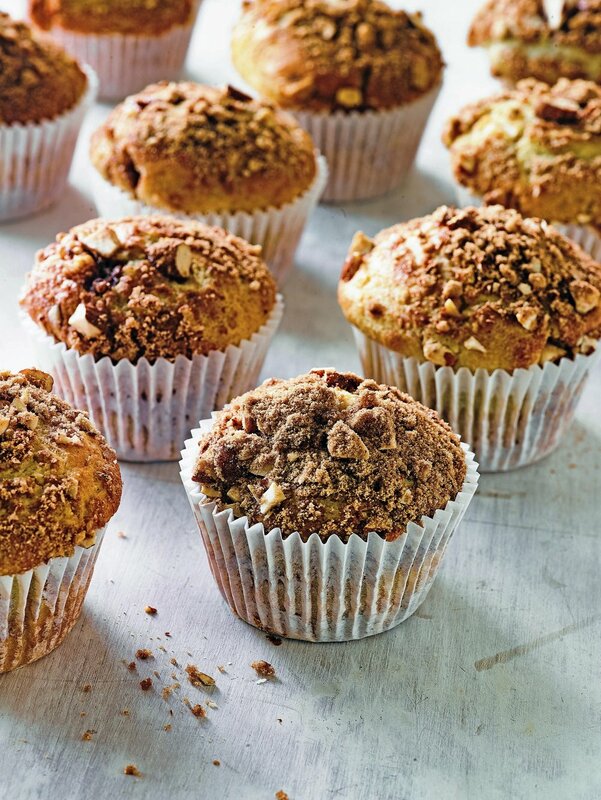 They are zingy with a fresh yoghurt topping, and will leave you feeling full with all the energy you need. They don't even need to be baked! 1. Preheat the oven to 150°C, gas mark 2, and line a large baking tray with parchment. Warm the honey, oil and salt in a small pan. Combine the oats, seeds and nuts in a mixing bowl. Pour over the honey mix and stir until coated. 2. In a small bowl, lightly whip the egg white until frothy, then stir through the granola mix. Tip onto the baking tray and spread evenly. 3. Bake for 25 minutes, then turn the tray and give it a quick stir before baking for 10-15 minutes. Turn the oven off and allow the granola to cool completely so it’s crisp, then stir in the dried fruit.The granola will keep for up to 1 month stored in an airtight jar. 1. Preheat the oven to 160°C, gas mark 3. Grease and line a 34cm x 22cm brownie tin with baking parchment. Arrange the flaked almonds and coconut on the lined tray and toast in the oven for 7-8 minutes, or until golden and fragrant – stirring halfway through to get an even colouring. Once toasted, tip into a large mixing bowl. Add the rice pops, oats and chopped mango to the toasted ingredients and stir to combine. 2. Meanwhile, place the sugar, honey and passion fruit pulp into a medium sized saucepan and stir over a low heat until the sugar has dissolved. Turn the heat up to medium and allow the mixture to simmer for 7-10 minutes. It will look slightly thicker in consistency. 3. Pour the hot mixture into the dry ingredients and stir until everything is well coated. Tip the mixture into the lined tin and use a spatula to press it down firmly into an even layer. Place into the fridge to set for at least 1 hour. 4. When the bars have set, make the drizzle. Melt the white chocolate in the microwave or over a pan of boiling water, then stir in the yogurt. Spoon into a piping bag and drizzle over the top of the set bars. Leave to cool completely, then slice into 24 pieces. Store in an airtight container for up to 2 weeks.